Kalmar, part of Cargotec, has recently delivered a total of 18 forklift trucks to the Algerian company Entreprise Nationale des Travaux aux Puits (ENTP). Created in 1981, ENTP is a subsidiary of Sonatrach and the leading drilling contractor in the country with a market share of close to 45 percent. 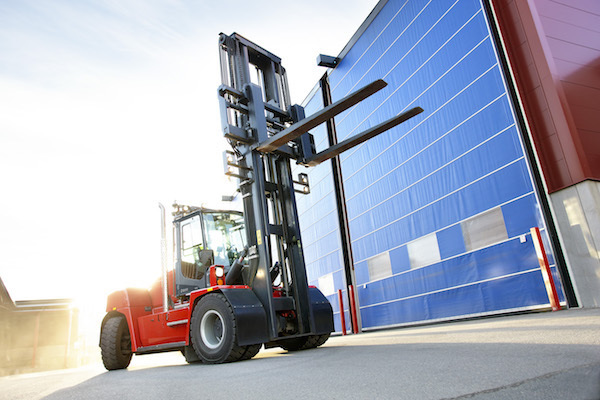 The Kalmar G-Generation forklifts have a lifting capacity of 14 tons and are ideal for handling heavy, bulky loads such as a section of pipe or pieces of drilling equipment. They are equipped with a variable hydraulic fan that according to the manufacturer keeps the engine and hydraulics cool even in the most extreme operating conditions. Kalmar has also adapted the machines according to the customer’s unique requirements, which included fitting the machines with a spark arrestor system to prevent any sparks from the machine’s engine from accidentally igniting flammable materials in the immediate vicinity. The forklifts were delivered during the third quarter of 2018 and are deployed at the company’s site in Hasse Messaoud, Ouargla in eastern Algeria. “We are delighted that ENTP has chosen our next-generation forklifts to support their drilling in Hasse Messaoud. They are the ideal choice for ensuring optimal performance in precisely the kinds of tough desert conditions that ENTP operates in, where extreme temperatures, sand, and dust are a constant challenge. This deal also marks a further step forward in our strategy to focus on new industrial segments, building on the excellent market share we already enjoy in the cargo-handling sector in Algeria,” said Alejandro Martinez, Mobile Equipment Solutions Sales Manager at Kalmar. The French group Total and the Algerian state-owned company Sonatrach signed two agreements on Sunday 7 October in Paris. 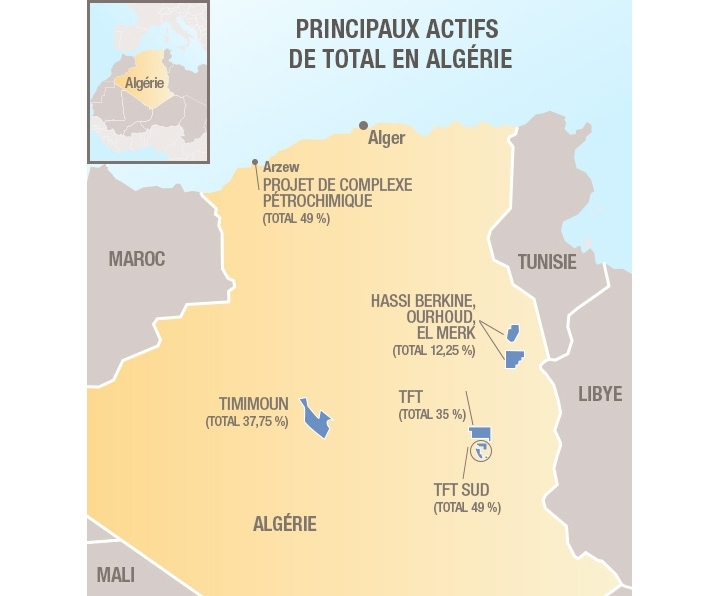 The first is a new concession contract for the joint development of the Issasouane Erg gas field, located in the South of the Tin Fouyé Tabankort gas field from which Total is the historical partner. Both companies are committed to make the necessary investments in order to value its reserves, estimated at more than 100 millions of oil-equivalent barrels (mboe). Investment needs for this project, for which the production launch is planned at the end of 2021, are up to 400 million dollars. In turn, a second agreement of joint-venture will allow to start their common project in Arzew (in Western Algeria). It will gather the construction of a dehydrogenation of propane factory as well as a polypropylene production unit with a 550 000t per year capacity. The first engineering studies are planned for November. ” Agreements signed today marked a new step-in the development of the strategic partnership between Sonatrach and Total in order to pursue the value of the country’s gas reserves bringing the best if our technological expertise,” stated Patrick Pouyanné, Total CEO. 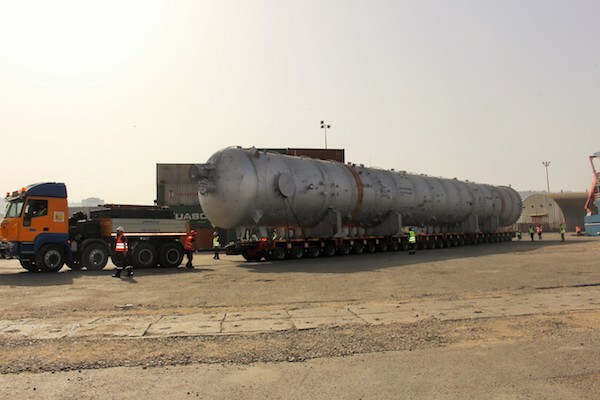 The heavy transport company Transmex, subsidiary of the Sonelgaz Group, has successfully transported a distillation column of refinery products. 42m long and 7m width, it weighed 216t. The entire convoy was 62m long, with a global weight of 400t. The item has been transported thanks to tractors in 8×4 and 6×6 axle combination, as well as SPMT of 26 axle lines, allowing a better load distribution and a greater stability. In Alger city, Transmex received the item in the port before crossing the center to reach the refinery in difficult weather conditions. This performance is a result of long engineering study and route optimisation bypassing all the civil engineering structures during the journey. This heavy unit has been transported for its client DB Schenker within the rehabilitation project of the Alger refinery, whose contracting supervisor is the oil giant Sonatrach. The full article is coming up in the next issue of Move It Magazine. 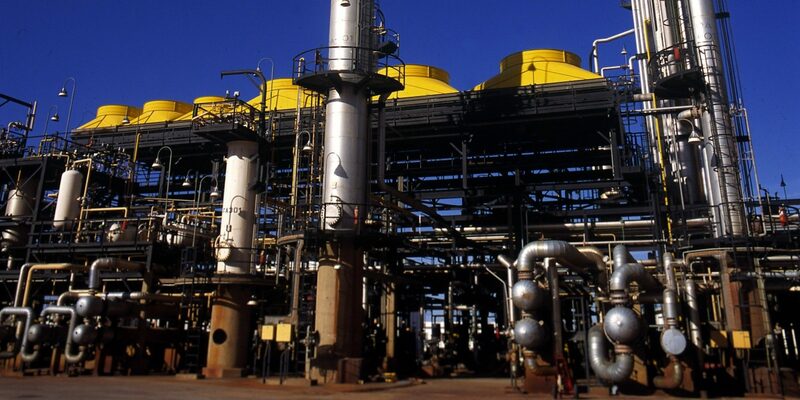 The French group Total and the Algerian state-owned hydrocarbon company Sonatrach have just signed an agreement to launch the engineering studies planned for this summer for a petrochemical project in Arzew (located in western Algeria). This project will include a propane dehydrogenation unit (PDH) and a polypropylene (PP) production unit with an output capacity of 550,000 tons per year and an investment of approximately $ 1.4 billion for the two partners. It will be used to transform propane into polypropylene, a type of plastic whose demand is rising strongly.